Today we have one of those pieces of scriptures that we should all know by heart; Peter’s profession of faith. There is so much in these verses that a book could be written about it. 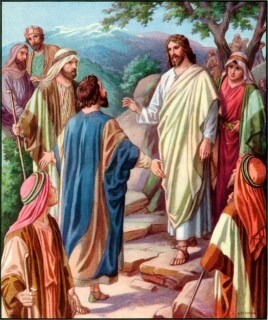 Briefly, Jesus asks the disciples what the people are saying about him. The disciples give him the answers that the people are saying that he is Elijah, John the Baptist come back to life or a prophet. Eventually Peter speaks up and says that he is the Christ, the Son of the living God. Why is this piece of scripture so important? Because it is the same question that Jesus asks us every day of our lives; who is Jesus to us? Is he a prophet, a philosopher, a great teacher? He is all these and more, he is the Son of God, and he is the image of the Father. If Jesus is just a teacher, prophet or philosopher then Christianity is just another run of the mill religion. But we say Jesus is God and that he is God in human nature and form. He is a mystery in himself, the mystery of the Incarnation. Our faith is a faith of a person, the person of Jesus. It is also a faith in a person, the person of Jesus. We believe he came from heaven, died and rose and saved us. In that we are Christian. Who do you say the son of man is? Or is the question, who do you say the Son of Man is? In the former, with no capital letters, he is just another man. In the latter, where the capitals set him apart as unique, he is the Son of God. This question and your answer to it shall define your whole life.